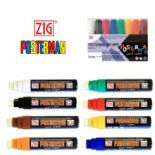 Zig Posterman wet-wipe chalk markers are great for all sorts of surfaces including glass, whiteboards, blackboards and chalkboards. 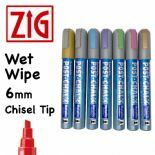 These wet-wipe chalk markers produce a chalk look without a chalk mess and work exceptionally well on blackboards, chalkboards and whiteboards and can be removed using a damp cloth. 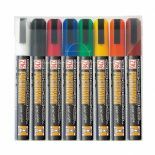 Used for indoor advertisements in shops, florists, pubs, bars and restaurants as well as around the home.